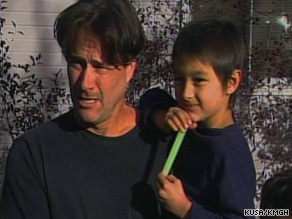 (CNN) -- After scouring northern Colorado by foot and air, frantically chasing a Mylar balloon for miles and repeatedly interviewing his big brother, authorities ended the search for 6-year-old Falcon Heene where it began -- at his house. 6-year-old Falcon Heene says he was hiding in a box in the attic while authorities were searching for him. "I played with my toys and took a nap," Falcon told a group of reporters outside his home Thursday afternoon. "He says he was hiding in the attic," said Falcon's father, meteorologist Richard Heene, clutching his son. "He says it's because I yelled at him." "I'm sorry I yelled at him," added Heene, tearfully hugging the boy. In a later interview with CNN's "Larry King Live," Falcon said he heard his parents call for him from the garage. When asked by his father on-air why he didn't respond, the boy replied, "You guys said we did this for the show." Authorities said they believe the case was genuine. The situation grabbed the nation's attention early Thursday afternoon, after authorities reported that the experimental helium balloon was set adrift with the 6-year-old apparently riding in it. Heene said the family was in the early stages of working on the balloon -- a "3D low-altitude vehicle" -- when the contraption and the boy went missing. His brother had said he watched Falcon get into the balloon before he untied the tethers, setting it free. Heene later said Falcon was videotaped getting into the vessel by his brother, but "obviously he got out." Authorities said the silver balloon, 20-feet long and 5-feet high, at times reached 7,000 feet above the ground while adrift. It was found more than 90 minutes later in a field near Colorado Springs. The story took a turn when ABC said that Falcon's parents, science enthusiasts Richard and Mayumi Heene, were featured on the 100th episode of ABC's prime-time program "Wife Swap" in March 2009. According to the network's Web site, the Heene family "devote(s) their time to scientific experiments that include looking for extraterrestrials and building a research-gathering flying saucer to send into the eye of the storm." Rescuers from several counties followed the saucer-like vessel until it made a soft landing some 90 miles away. Officials rushed to the scene of the landing, smacking the metallic balloon until it deflated. They looked inside -- no Falcon. At that point, there were two possibilities: Either Falcon never got in the balloon, or he fell out. Authorities began to fear the worst after reports surfaced that a box possibly carrying Falcon may have fallen off the balloon. The widespread worries prompted the Colorado Air National Guard to deploy a UH 60 Black Hawk helicopter, with plans to launch a second one equipped with night vision if necessary. The search, which initially focused on Weld County, covered "the entire flight plan, from the Fort Collins area down to the Denver International Airport area," Col. Mark Riccardi said. But a little while later, Falcon turned up at home. Larimer County Sheriff James Alderden said it's not uncommon for children to seek cover when they realize they're the subject of a massive search. "They hide because they think they are in trouble," he said. "What was confusing was the eyewitness who said [Falcon] climbed into the apparatus, which was not the case," Alderden said, referring to the boy's brother. The sheriff said the brother was interviewed several times by investigators and that he was consistent with his story. "Basically, the whole family was out there and they were working with it," he said. "When I came back is when I found out that the event happened." He said the aircraft was intended to hover around 20 feet in the air and was not intended to carry people. "Obviously, something went wrong with that." Friedland described his neighbors as "a great family." "They're unusual, yes, of course. He's sort of a scientist-slash-inventor. They're storm chasers -- they go after tornadoes, hurricanes, things like that," he said. "He's a great kid," Friedland said of Falcon. "We see him a lot and they come over and they're always friendly."